Product/Market fit now has its own book. Alexander Osterwalder wrote it. Read it. The Lean Startup process builds new ventures more efficiently. It has three parts: a business model canvas to frame hypotheses, customer development to get out of the building to test those hypotheses and agile engineering to build minimum viable products. This week the author of the business model canvas, my friend Alexander Osterwalder, launched his new book, Value Proposition Design, the sequel to his million-copy best-seller, Business Model Generation. Value Proposition Design is a "must-have" for anyone creating a new venture. It captures the core issues around understanding and finding customer problems and designing and validating potential solutions. If you're familiar with the Lean Startup, you know that the Business Model Canvas is the tool to frame all the hypotheses of your startup. Of all the 9 boxes of the canvas, the two most important parts of the business model are the relationship between the Value Proposition (what you're building) and the Customer Segment. These two components of the business model are so important we give them their own name, "Product/Market Fit." 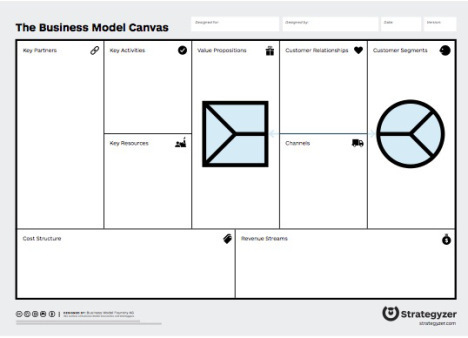 The Value Proposition Canvas functions like a plug-in to the Business Model Canvas and zooms into the value proposition and customer segment to describe the interactions between customers and product more explicitly and in more detail. This keeps things simple by giving you the big picture at the business model level and the detailed picture at the "product/market fit" level. Alexander and I met after he published Business Model Generation. We both realized that we had each invented one of the two parts that define the Lean Startup. In his new book he's integrated Customer Development with the Business Model and Value Proposition Canvas and added some new tools to the mix. Now an integral part of Value Proposition Design, several of his new tools help with testing and validation of hypotheses. These testing tools match the first two of the four steps of Customer Development. The diagram below is one of my favorites of the book and provides a simple overview of how to conduct customer discovery and customer validation in combination with the Business Model and Value Proposition Canvas. You start by extracting and prioritizing your hypotheses, then design your tests with Test Cards and finally, you conduct your tests and capture your learning. To make this all actionable Osterwalder added an Experiment Library to the book that equips you with ideas on how to test your assumptions. With Customer Development you're constantly talking to customers and partners and conducting a ton of experiments to validate and invalidate your hypotheses. All these activities, the evidence of what works and what doesn't, and your progress towards finding a successful value proposition and business model need to be tracked. In Value Proposition Design Osterwalder shows how to do this with the Progress Board, a tool that includes a version of my investment readiness level thermometer to track progress. Doing all the above together with your team is not easy when you "just" use poster-sized Canvases, sticky notes, and PowerPoint. There are simply too many Canvases you will design and trash (after rejecting and pivoting from your early tested ones), too many experiments you will conduct, and too much evidence you will produce. Keeping track of all this requires software support. 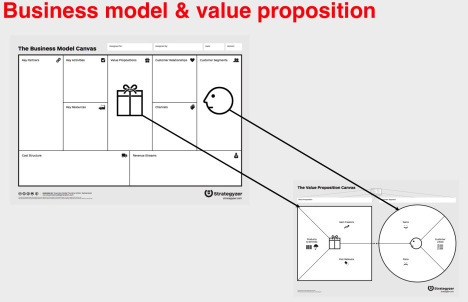 So the Value Proposition Design comes with a series of exercises that you can complete online with assessment tools that show you how you are using the Value Proposition Canvas. And last, but not least, you get access to a whole series of checklists, templates, and incredibly awesome posters that you can immediately use in your work.